Heldenplatz is a three-scene play first performed in 1988 as part of the centenary celebrations for Vienna’s famed Burgtheater, but anyone who has tried Bernhard’s work before will be less than surprised to hear that it’s not the most generous of presents. Cleverly, and nastily, the writer chooses to focus the action of his work not on one hundred glorious years of Austrian theatre but on a rather less impressive milestone. Yes, Bernhard’s gift to the good people of Vienna on this momentous occasion was a play digging up memories of Austria joyfully allowing itself to be annexed by Germany, celebrating fifty years since Hitler made the announcement of ‘Anschluß’ at the main town square, Heldenplatz. Happy anniversary, everyone! The play is set in 1988 in a noble apartment in the middle of Vienna, and the first scene sees two women clearing up the apartment, with suitcases and bags everywhere. As the housekeeper, Frau Zittel, prattles on, with the occasional interjection from Herta the maid, the reader (or spectator) wonders what is going on. We eventually learn from the chatty housekeeper that the bags were intended to be sent off to Oxford, in advance of their owner’s (Professor Josef Schuster), return to England. However, an unforeseen event has necessitated a change of plans, namely his decision to plunge headlong over the balcony of his Viennese apartment. The cries she hears are not those of the present but of the past, ghostly memories of the atrocities of 1938. It’s little wonder she wants to escape when she’s haunted by the howls of the Nazis in her own home. On hearing these views for the first time, many readers will suspect the professor of exaggeration or even slander, but when his brother makes his first appearance, he’s even more vehement in his views, leading us to wonder if there’s something to his opinions. Professor Schuster himself is sadly not present, of course,but he’s a central figure in the drama, nonetheless. Frau Zittel paints a picture of a tyrant needing to have things his own way, with a nature that demands perfection not only in his mathematical studies but also when it comes to folding his shirts. He’s a figure tortured by his love for, and hatred of, his home town; like many Bernhardian protagonists, he’s far too intelligent to fit in, and while we only meet him after his death, we sense he was doomed long before. This isn’t the only connection in Heldenplatz to the rest of the Bernhard oeuvre. We have the customary exaggeration, with the speakers spiralling into monologues of rage, and a choice selection of the writer’s favourite words (‘Vernichtung’, ‘Unrat’), and the family tendency to end up in the Steinhof medical centre /mental institute has echoes of Wittgensteins Neffe (Wittgenstein’s Nephew). The placing of the second scene in the Volkspark is no accident, either. There are prominent mentions of the Austrian parliament and the Burgtheater in the background, both frequent targets of Bernhardian bile. There’s a lot to like about Heldenplatz, not least the usual, angry monologues once the characters get going. It can be funny in places, too, such as when Frau Zittel’s lengthy monologues are interrupted by Herta’s unrelated queries. However, as a play, not a novel, there are limitations when it’s simply read, and it does drag in places (scenes one and three, in particular, start rather slowly). The pace always picks up eventually, but these lulls affected my enjoyment a little. 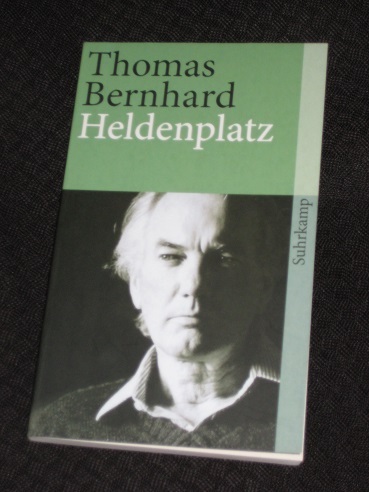 I didn’t know that Bernhard had written plays as well as novels. I still haven’t read anything by him which is strange as he’s obviously an author I’d like. Ja, ja, very much more welcoming and friendly… it’s always there once you scratch the friendly veneer, as you saw in the recent elections. My Austrian friends (but we all went to the international school together, so they are not typically Austrian) are NOT impressed. Pat- Lucky you! In French or German?